1. Matrix: In the scene where the princess is fighting with Robin Hood's men the action freezes she jumps up, camera whirls around for a moment and then the action continues. 2. The Swan Princess: Swan by day, Princess by night. Princess Fiona, is cursed to be ogre by night and Princess by day. 3. Charlie's Angels: Cameron Diaz became very physical when recording her Matrix-style kung fu moves for her scene with Robin Hood and his Merry Men, and even broke out into Cantonese at times since she had completed Kung Fu training during the production of her film. 4. Austin Powers: In the intro, Shrek brushes his teeth and looks at himself in the mirror, which then breaks. 6. The Beauty and the Beast: When Princess Fiona is transforming near the end of the movie, she floats and shoots bolts of light out of her fingers and heels. 7. The Dating Game: When the mirror tells Lor Farquaan about the Princesses. 8. Wo hu cang long (Crouching Tiger, Hidden Dragon): The filmmakers stated that Princess Fiona's martial arts were inspired by Jackie Chan but also, late in the production by this movie. 9. Three Little Pigs: Three pigs in Shrek's swamp. 10. The Last Unicorn: Unicorn in swamp. 11. Snow White and the Seven Dwarfs: In the swamp. 12. 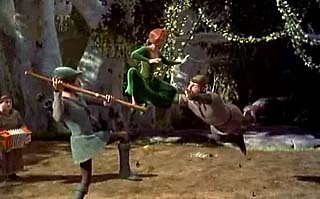 Robin Hood: He and his merrymen attack Shrek. 13. Cinderella: She and her Fairy Godmother in the swamp. 14. Pinocchio: He and Gepetto. 15. Little Red Riding Hood: The Big Bad Wolf. 16. Sleeping Beauty: The three fairies in the swamp. 17. Goldilocks and the Three Bears: two in the swamp and Mama bear as a rug skinned and laying on the floor in Farquaad's castle. 18. Dungeons & Dragons: The entire 'escape from the tower' sequence. 19. A Knight's Tale: Shrek fighting the knights. 20. WWF: Shrek's wrestling agaisnt the knights. 21. WWF - Kane: When the masked executioner is singing. This is a reference to a Stacker 2 commercial that World Wrestling Federation character Kane (who also wears a mask) appears in, singing karaoke. 22. Jackie Chan: The filmmakers stated that Princess Fiona's martial arts were inspired by him. 23. Disney's "It's a Small World" song: The song "Welcome to Duloc", which is sung by the wooden dolls in the cabinet at the entrance to Duloc, is not only a parody of Disney's "It's a Small World", but is in the same key and has the same beats per minute (tempo) as the Disney song. 24. Birth of Venus painting: In the scene where Lord Farquaad is in his bed watching the clip of Princess Fiona in the mirror, there is a painting on the wall behind him. It bears a striking resemblance to Botticelli's Birth of Venus painting, but with Farquaad in the center, standing on the shell where Venus would have been. 25. The NeverEnding Story: Donkey and Shrek flying on Dragon. Got any in joke not listed here? Email it to me!